To meet the ever higher requirements imbued by professional users and enthusiasts alike, Silverstone created the Strider Gold series power supplies. The Strider Gold models are built on similar platform as the award-winning Strider Plus series but with even higher efficiency ratings. The Strider Gold series will encompass wattage range from 550W to 1200W for a great variety of applications. 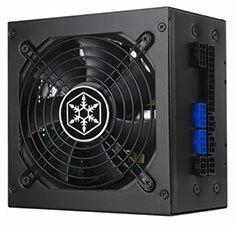 With a 140mm depth for easy integration, the ST65F-G is the world shortest modular ATX PSU. In addition to 80 PLUS Gold level efficiency, all models are built to meet very high standards in electrical performance so they have ~3% voltage regulation, ~3% ripple & noise, and high amperage single +12V rail. Other notable features also included are 24/7 40C continuous output capability, low-noise 120mm fan, and multiple sets of PCI-E cables. For users looking for a power supply with faultless combination of performance, efficiency, and quality, there is no need to look beyond the Strider Gold Series.